Some types of coffee are very rich, and some types are priceless. Our painter friend Debbie Adams painted a picture of Fraz’s new beach house retreat in North Carolina. 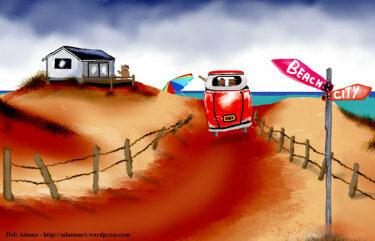 The original painting of Fraz’s Beach House can be seen on Debbie’s art blog. I wonder what Fraz would do with all the gold and diamonds? I bet he doesn’t even pay bills yet. How come Fraz gets my gold nuggets and diamonds? I’m the one who asked for them! I tried this at Starbucks and they gave me a weird look. Sheez, thanks for nothing. Maybe you should have asked for stars? I’d like that! And if enough people start asking for gold and diamonds in their coffee, maybe they’d start giving it to us! I think that’s because you don’t get enough wine gums over in Germany. You don’t know what you’re missing! You poor, poor ghost! I think Winky should get what he wants since they asked! And because I said please, too! Yes, you were very polite! 🙂 I think for that they should give you a double! They said they didn’t have and gold or diamonds to give me! Well lets blow that joint and go over to your factory and taste chocolates then! Chocolate is better than gold anyway since you can eat it! That right!….So what’s on the chocolate menu? Chocolate maple fudge, chocolate pie, triple chocolate layer cake, chocolate covered chocolate, and chocolate chip chocolate cookies. Sounds good. I’ll supply the chocolate milkshakes. It’ll be a full-course chocolate feast! I could blow them up with my rockets afterwards, if you’d like. It would be a show! Thanks for posting, Fraz’s new beach house, Peter! I made him post it! I want everyone to know where my beach house is so they can come to my parties! And big parties you shall have too, Fraz! And you have all the comforts of home there, with a big screen tv and plenty of beach front property! I know! And it’s great! Plus everyone can take my pirate ship over to my island too! Or Genie can take them over on his flying carpet! Or Prancer or Ferrari can take them too! Bruno already has his nose blue waiting to go. I hope he can come over! And Claret too! Ferrari is at my house now. I’m gonna hop on her back and have her run me over to your place now!…Put some shrimp out for her so she don’t get into the chocolate again. I’ve got a big bowl of shrimp just like she likes them! Raw! Yuck! Yep! And lots of goodies we can put in the milkshakes too! We’re having one now! Why aren’t you here?? Remember to wash the shrimp smell off you hands before we make milkshakes…cos if they smell of it they will be icky. I will! No one would want a shrimp milkshake! Well maybe Ferrari. Deb’s art is always fun, that’s for sure. Deb’s art is rather hard not to like. That’s an odd request. I have a request for you. Please be sure not to miss my post on Very Special Bloggers. That was a very nice honor, Joyce! Thank you for the recognition. I always enjoy reading your humorous stories about your life and family. Hahaha… now THAT’S an upgrade! To think I would have settled for Coke. I found out they didn’t have any gold or diamonds, though. I saw that, that was a very nice thing for Joyce to do! Thanks for stopping by, Rosey. I don’t like coffee either! I just wanted the gold! Bwahahahahahahaha. Well it doesn’t hurt to ask does it? I didn’t think so. No, it didn’t hurt at all. I didn’t get any diamonds, either, though. That’s how I order my coffee. It’s a little hard to swallow though. You should try drinking it through your teeth! No, it is easier if you use a straw. They are too big to get stuck. Chris, what kind of slipshod coffee stand is this? I bet the donuts do not even have sprinkles. The doughnuts do have sprinkles, but are lacking in diamonds just like the coffee. They’re good! Even without the gold or diamonds. I gotta try that next time. True story: When my kid was very young, we went to a sit down hamburger joint and the waitress asked the kid ‘how do you want your burger’ and she said ‘ROUND please’! She and Fraz would get along well! W.C.C. Yeah, square burgers are only good if you have square buns! I’d drink it just for the diamonds! Just be careful not to drink the diamonds like this woman did! She was going to have a colonoscopy so the doctor got it for her. she should have dip her finger in the campagne first. Yes, that would have been a lot less traumatic! Oh what is wrong with this world?? Why ask us when you can’t give what we want? Yeah, if they don’t want to give us what we want, I don’t know why they bother asking us. The world is crazy sometimes! I’m kinda used to people calling me silly. I guess maybe I am sometimes. You can come over anytime, Dilip! Well Fraz did get to the point. If you don’t ask you don’t get. Even if you do ask, sometimes you don’t get. With the price of a cup of coffee these days, you’re not too far off! It should at least come with gold dust! Has he been talking to my wife? No, but she must have good taste. Winky, I wish it were that easy! Well it was worth a try! That’s what I say! We should demand gold and diamonds in our coffee! Yeah, that’s my favorite kind! Hey, ti was worth a try. I may go to Starbucks and try out that ploy myself. Let me know if it works! I wouldn’t mind paying $5 for a coffee if it was full of gold! Ahahah I’ll ask the same thing next time. I hope it works better for you!